In case you have a shred of doubt on the importance of making your own baby food from organic produce, or at least buying organic jars, read what EWG found when they tested numerous jars of baby food!! The USDA’s monitoring program tested about 585 samples each of green beans, pears and sweet potatoes processed as baby food, all purchased in American stores in 2011. 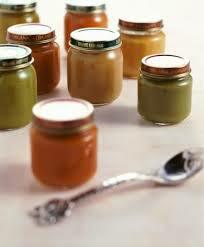 These three types of baby food were tested in 2010 with generally similar findings. Green beans canned for baby food tested positive for five pesticides, among them, the toxic organophosphates methamidophos and acephate. Methamidophos was found on 14.4 percent of samples and acephate on 12.6 percent. We are encouraged by EPA’s success in ending the use of these two chemicals for use on green beans. We urge EPA to continue to restrict these and other highly toxic chemicals from produce, particularly the foods most consumed by children. We urge USDA to continue to monitor green beans canned for baby food to ensure that any insecticides adopted as replacement do not pose similar health risks. Pears processed for baby food showed 11 pesticides. Fully 94 percent of the pear samples tested positive for at least one pesticide residue, and 18 percent of the samples were tainted with 5 or more pesticides. The pesticide iprodione, which EPA has categorized as a probable human carcinogen, was detected on 16 baby food pear samples, or 2.7 percent of the samples in the latest round of testing. Iprodione is not registered with EPA for use on pears. Its presence on this popular baby food constitutes an apparent violation of FDA regulations and the federal Food, Drug, and Cosmetic Act. The one bright spot was sweet potatoes processed as baby food. These showed virtually no detectable pesticide residues. The extent of pesticide contamination of baby food documented by USDA highlights the need to accelerate testing of baby foods and for EPA to minimize the organophosphate pesticides exposures allowed for Americans, especially infants and children. Previous Jess’s homemade deodorant & body scrub are now for sale!! Next Knowledge is Power! !